Hi Michael & other people interested in this topic. My crude plan, Michael asked me for it in another topic, for loading the Schwerlastwagen and other railroad platforms, is to make use of a system that already exist in Railroad modeling. Fine scale train modelers have an almost ISO approach for module building, its called FREMO. You can download such plans for e.g. H0 scale and use that to scale it up to 1/35. It gives exact measurements for display and is perfect to connect new sections, building a diorama. Positive aspect I guess. Plan is to build a platform where material is lined up, waiting to mount the train. For the layout I want to use photos from the old train stations, which you can find easily on the web. The track on such a module / section is always the centerline or connection (FREMO). I have to search for some practical information to make it work for me when it comes to scale metal tracks and wooden sleepers, I've seen already (and not too expensive) just to get it right in length and expression of the materials. Those plastics from whatever manufacturer just are not ok! So I will build my own in 1/35 scale. Now why did the SSys got on hold? Reason the build is somewhat of my interest right now, is simply my focus on details, that after a while, will disappear because its useless to add, so I need something to get me starting again, a fresh idea, finish other stuff and jump back to this one when done. So I build the loads, like the Büssing, KDO, etc. Will post more info on the SSys very soon. Interesting question posed by Gregory Copplin regarding the folding "fence" at one end of the car. What you suggested Michael. Getting it folded for a reasonable length and drag behind the Tiger. Using a crane and winch at the front, seen on earlier post with damaged Tiger to get it underneath. On a SSyms there is some space to manouvre behind the Tiger to get this done . I know nothing as to the massive "portable" ramp that could allow the tanks to climb up from the end of the flatcar. 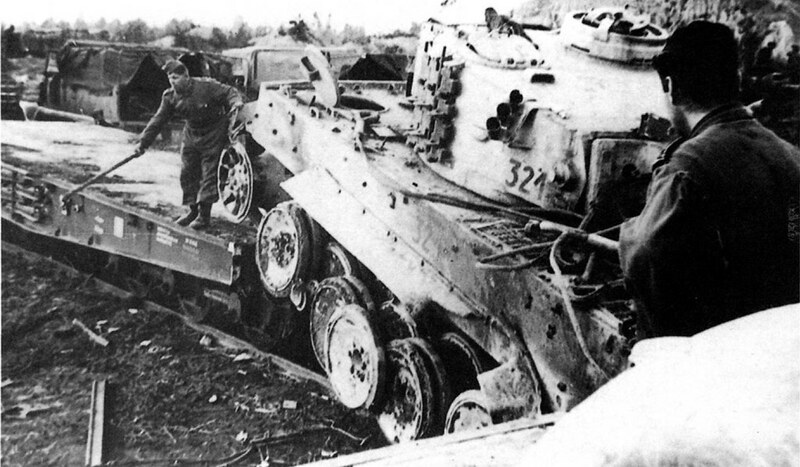 A portion of such a ramp is shown in the photo I posted on the loading of the second damaged Tiger 1. That still does not answer the question of how they would handle a 6300 pound wiggly snake of a combat track once they had gotten it removed from the tank??? I planned to upload the same pictures, all been shown by now. The question is Chicken or Egg, what came first: track or tank? Yes, side loading from a station freight platform of equal height positioned right next to the flatcar is probably the system most often employed. Most stations of the day had such a platform. Also a model of such a ramp is currently available. Good to see H.P. refers to this build, I'm following with great interest! But for the tracks to get them on the flatbed, I have my doubts in separate them in lighter sections. Why? It's time consuming and logistic not very plausible. There is 1 option for loading them to the wagon. Under the Tiger, when transport tracks are applied it leaves just enough space for the Tiger to position it self, part fits as rolled back. But how to mount the Tiger? Tigers for transport mount the wagons at the end of the train, or mount sideways from the platform directly, when it is even in height, think that is the most logical way IMHO. Changing the Fighting Tracks to Transport Track is done on the train station's platform or somewhere close. I've seen some pictures of that and also Tigers mounting the wagons sideways. 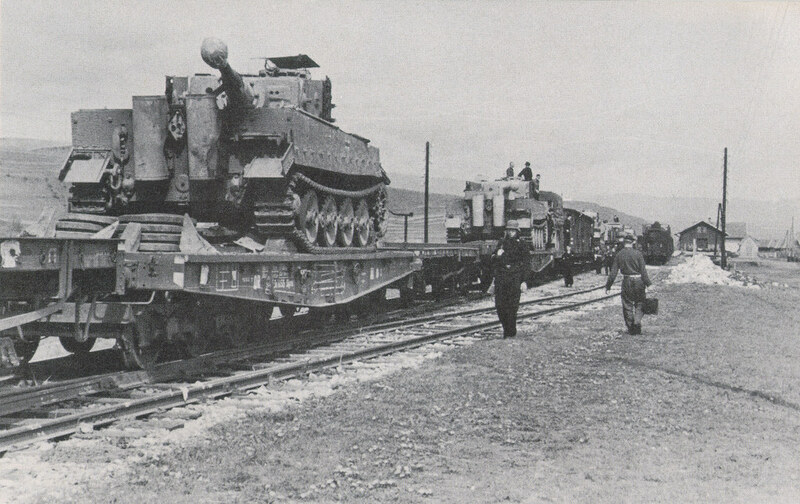 Mounting them and getting secured to the wagons, known it's not just one Tiger for loading, leaves time for the crews to organize additional loading of the tracks and other equipments belonging to the Tiger. Using a winch, like from a Famo, seen earlier today is very plausible. 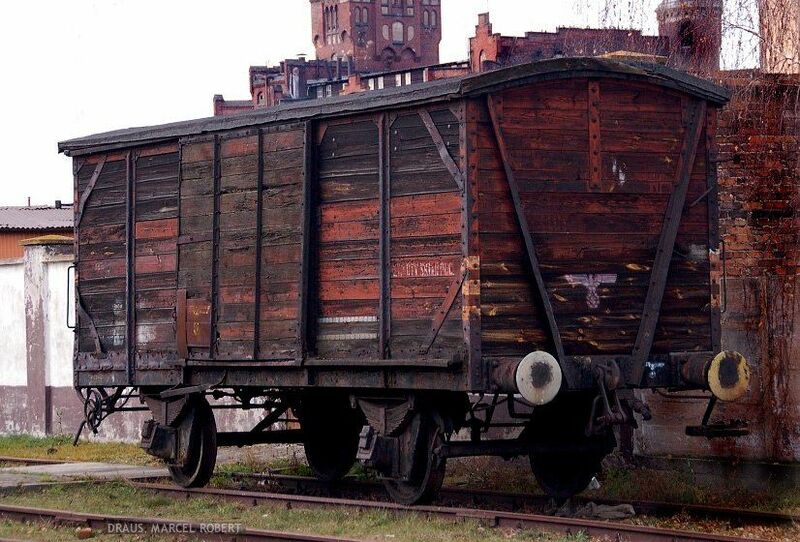 Keeping in mind it is not a 2 hours job, these logistic operations, when time was still on their side, maybe took a day or even more, but were clockwork logistic performances of the Reichsbahn. Will search if I can find that picture of changing the tracks, it is somewhere on my Mac, pretty interesting with a crew showing how they did that. also the storage with the chocks behind the Tiger(think I posted that already) shows how organized the worked. I had wondered what those cross wise grooves or plates in the decking were for???? Removed by original poster on 02/14/19 - 12:08:16 (GMT). Note those thick boards running lengthwise on the flatcar. If these are spiked down to the decking they could easily help keep a parked tank from sliding laterally off the flatcar while moving. While I doubt that crane could pick-up a full length of track - it really doesn't have to! - Track easily breaks into sections so pick up sections of track rather than the whole thing all at once. I'm guessing the use of this type of fixture was a standard shipping practice. It's getting better and better. Now would a Büssing L4500A with Bilstein crane manage to lift such a track? Will check. Interesting addition for loading the Tigers. Know I'm curious for the vehicle or maybe the winch pulling the cables. Robert, I agree. It looks like the main winch vehicle (or possibly two) are on the ground on the close side of the train. However you can see a second lighter cable coming off the front driver's side corner of the tank pulling towards the off side of the train. The main winch pull is not along the exact centerline of the flatcar so the main cable will be pulling the tank at a slight angle. That makes the other cable necessary to keep the tank moving forward and not end up going off the side of the railcar. I really like that picture. You can see the equipment used to pull the Tiger onto the SSyms. Know I'm curious for the vehicle or maybe the winch pulling the cables. 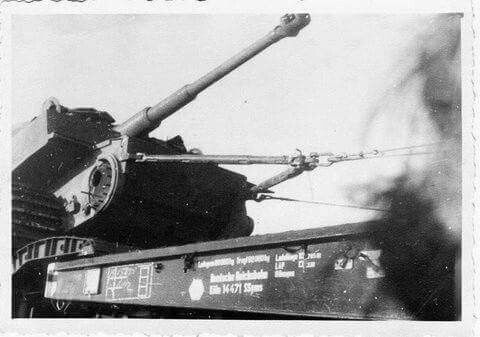 Interesting photo showing the rail loading of a damaged Tiger I. 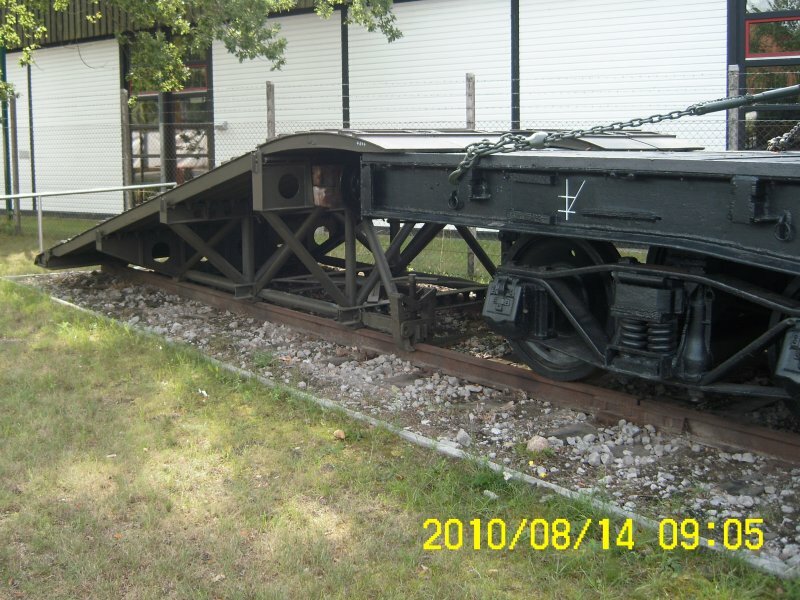 Both final drives have been removed but notice the now shortened tracks have been reapplied and simply wrapped around the road wheels to allow the tank to still be rolled onto the railcar. On the lower photo the travel tracks are available but are not being utilized. I wonder if there weren't boards or internal blocking between the treads to keep the tanks for sliding laterally on those flatcars? I think I see some wood blocking under that first Tiger. Considering they did not bother to cross tie these Tigers using the towing clevises there must be something in under there. Admittedly they are going to get some "bite" between the weight of the tank, those cleated all metal tracks and the wooden deck. But I wouldn't trust that. I know from bitter experience that if that were a metal load deck that Tiger would slide like a Sherman on ice going around a curve at railroad speeds. If you have a metal deck YOU MUST cross tie a tracked load. I've seen a Hetzer almost slide off a tilt-back trailer while just trying to climb up on to the tilted metal deck surface. 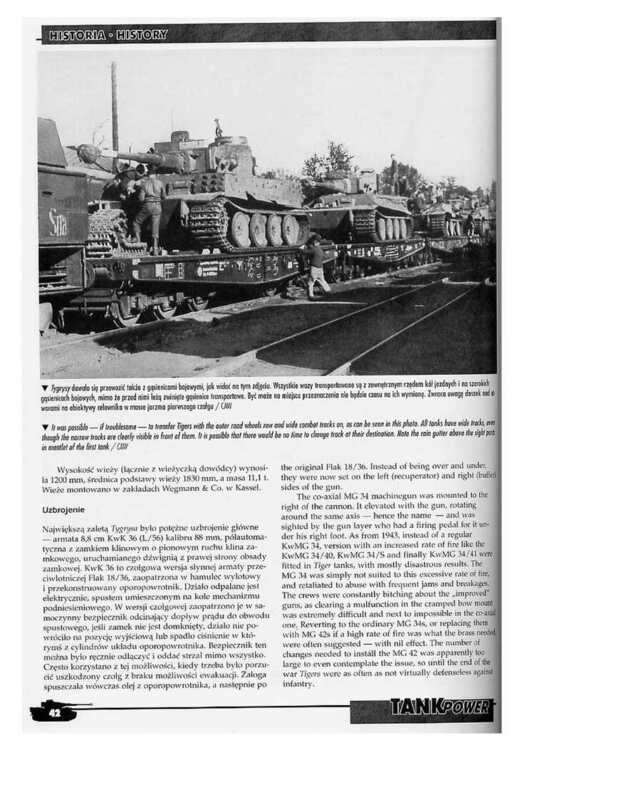 And the Patton Museum has had both the Jagdpanzer IV and the T28 slide off of military (US Army) tank transporters. (Not the Museum's doing but the Army load handlers!) The Jagd was a loading accident but with the T28 someone thought they could safely get away with moving that monster the short distance between the Museum and the Motor Pool without tying it down. From the pictures you see there are no cables to fasten the Tigers to the flatbed. So running out of time they where for sure. I'm following a build on Missing-Lynx about the SSyms, really detailed and from scratch, (including a debate on the special attachment points for anchoring the heavy beasts) this picture proofs to be a wartime reality, go go go. Only see some wooden chocks, that's it. Very good information and nice build so far. I would have to assume this is an emergency movement and the tanks may be going directly into combat upon arrival.